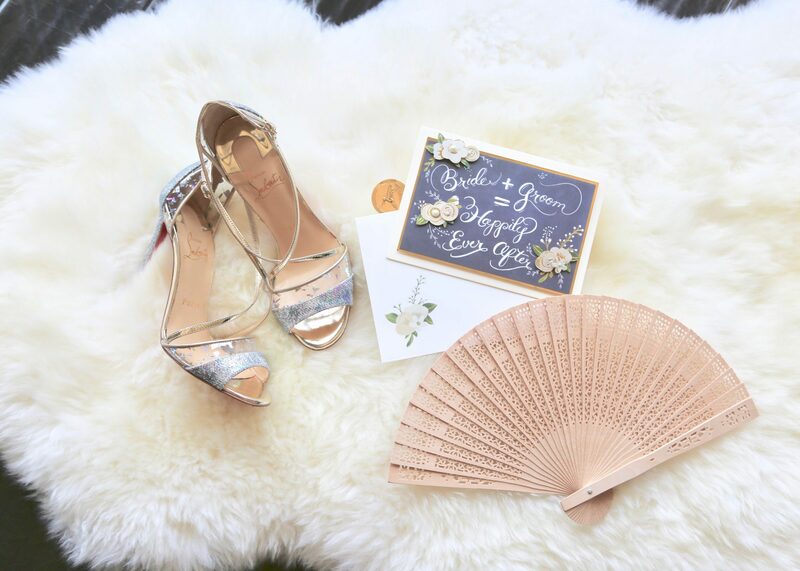 Wedding Season Ready with Papyrus! Wedding season is upon us, and Papyrus has got me covered! Whether you are a wedding guest or a bride/groom to be, you will find everything you need at Papyrus! A wedding is one of the most special moments in someone’s life, and there is no better way to elevate and celebrate it than with the joy of a beyond beautiful Papyrus moment! As everyone knows by now, I’m obsessed with Papyrus! I love how unique and innovative all their cards are, and amount of thought and love brought into the design and details of every single card and product they come out with really makes all the difference. I am especially in love with their new product categories like entertaining and desk accessories – you’ll see later how I used the entertainment pieces to decorate my sister’s bachelorette party! 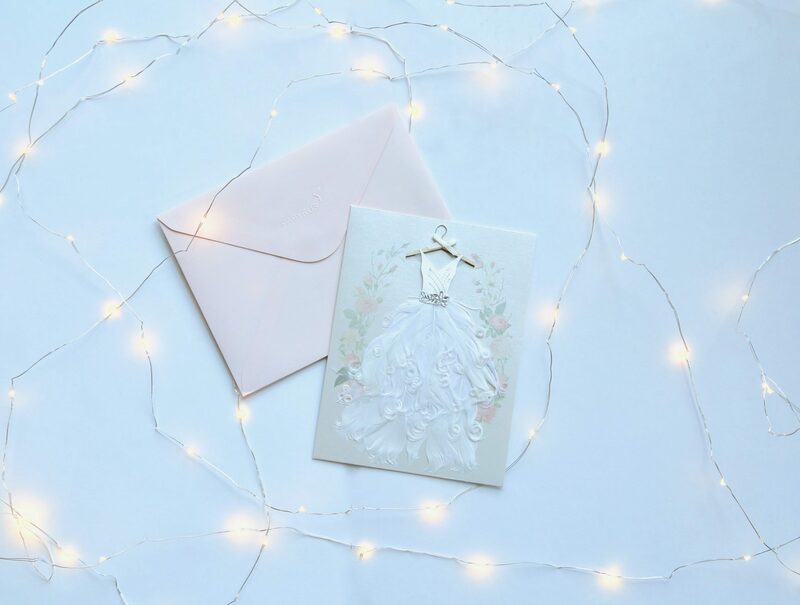 Everyone knows that Papyrus has the most luxurious and stylish cards and gift wrap products around, and it is the same when it comes to their wedding collection. They make cards and giftwrap that are just as beautifully detailed as the wedding itself! To me, a card is always the most important and special part of the gift because it is a visual expression of how you feel in your heart. Laser-Cut Cake on Lavender Glitter, buy here. Vintage Lace Medium Gift Bag, buy here. Graceful Bloom Small Bag, buy here. Graceful Bloom Medium Gift Bag, buy here. Forevermore Tissue Paper, buy here. Graceful Bloom Tissue Paper, buy here. Printed Foil Gold Heart Tissue Paper, buy here. The wedding dress is one of the most important and memorable parts of a wedding, and I love that Papyrus highlights this special moment in their cards too. They really do think of everything! Vibrant Butterfly Wedding Dress Card, buy here. Lace Wedding Gown Bridal Shower Card, buy here. I always love the handmade feels of every single card – there really is a card for every type of bride! Loving this one for the more rustic bride! Bride & Groom Chalkboard, buy here. For those who can’t wait to be called Mr. and Mrs.! 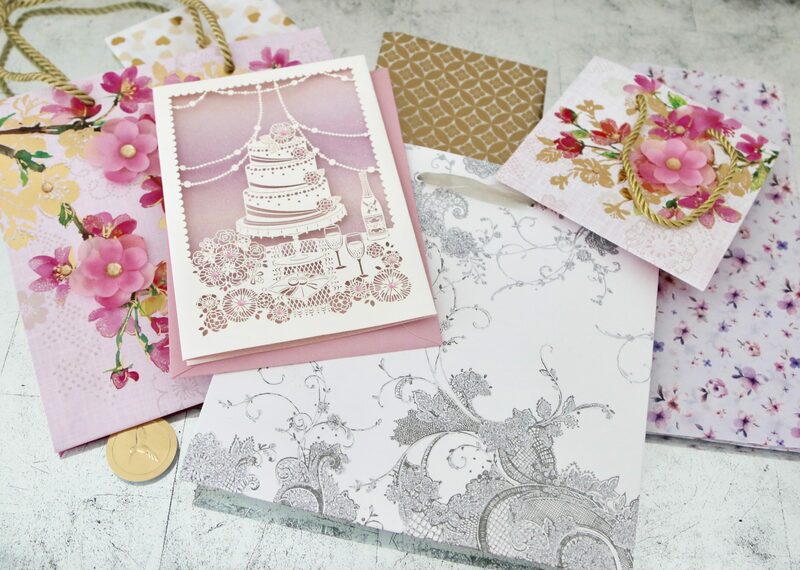 There are so many gorgeous cards and entertaining pieces for this theme! How adorable!! Whimsy Bridal Outfits Card, buy here. Happily Ever After Party Picks, buy here. This is probably my absolute favorite card from the collection. It is from the Judith Leiber Couture collection (which is the newest of Papyrus’ collaboration series), and I cannot believe how gorgeous this card is!! The entire collection of gem-encrusted wedding cards are modeled after some of Judith Leiber’s most iconic wedding handbag designs! I am so obsessed with this card!!! I’ve already chosen it as the one I will give to my sister for her special day coming up – it is so beautifully embellished and perfect for the super glamorous or over-the-top bride!! 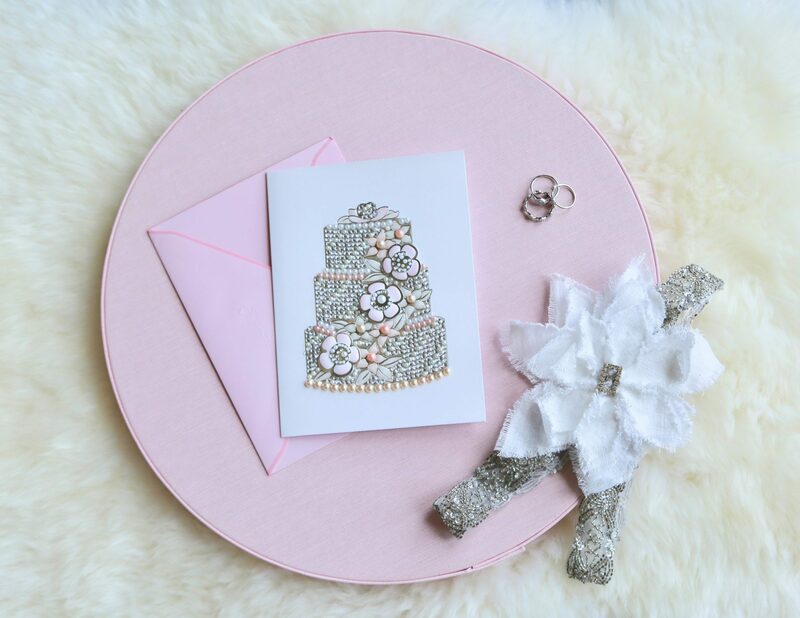 Pink Pearl Wedding Cake Card, buy here. How fun are these beautiful top hats from the Judith Leiber Couture Collection?? 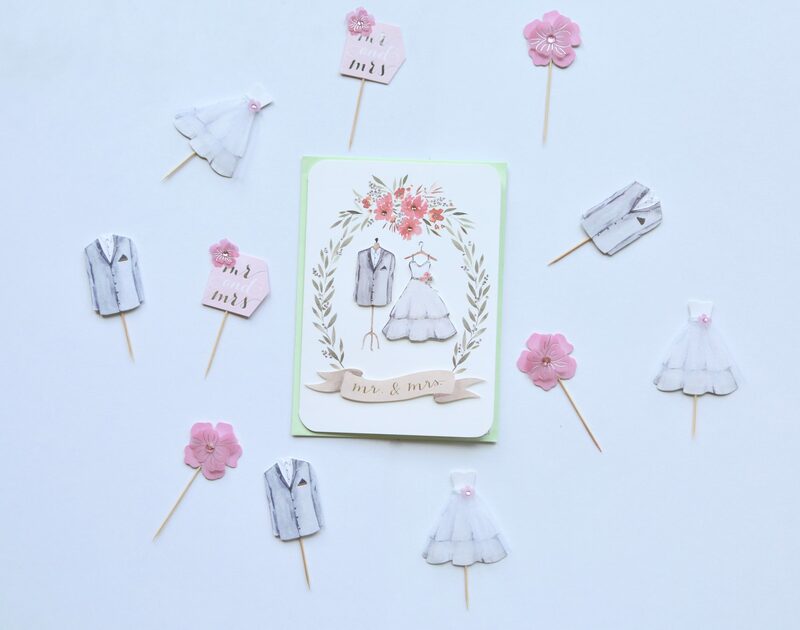 Love this card for a more modern bride (or grooms)! Also, how cute are the heart gift toppers? Top Hats Wedding Card, buy here. Gemmed Silver Heart Gift Topper, buy here. Papyrus just has so many different designs and styles to choose from. 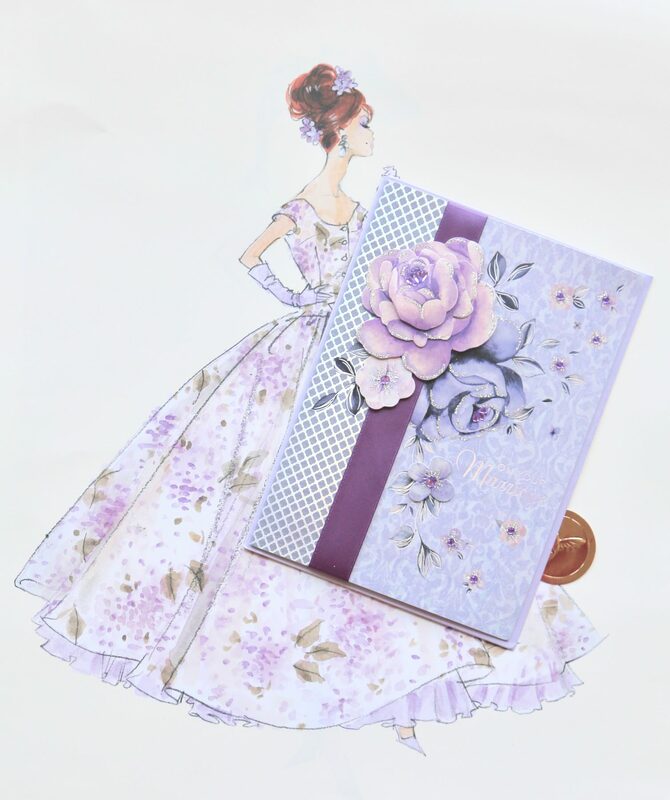 This card is another one of my favorites, it is just so delicate and beautiful! This is a great example of a card that is simple in concept but stunning in execution – the colors and glitter and ribbon details are just enough to make everything pop! Lavender Wedding Blossoms Card, buy here. I recently attended a friend’s wedding and opted for this gift bag to match the card from above! It was the perfect set and really complemented the wedding theme! Forevermore Medium Gift Bag, buy here. Papyrus has what you need for every occasion! 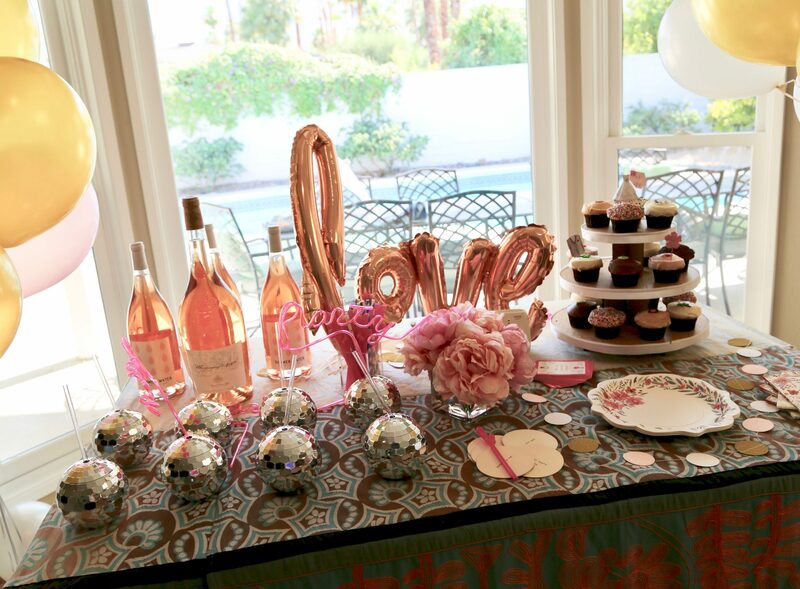 I recently planned my sister’s bachelorette party in Palm Springs, and incorporated several pieces from Papyrus’ event decoration collection for the occasion! How adorable is the set up!? 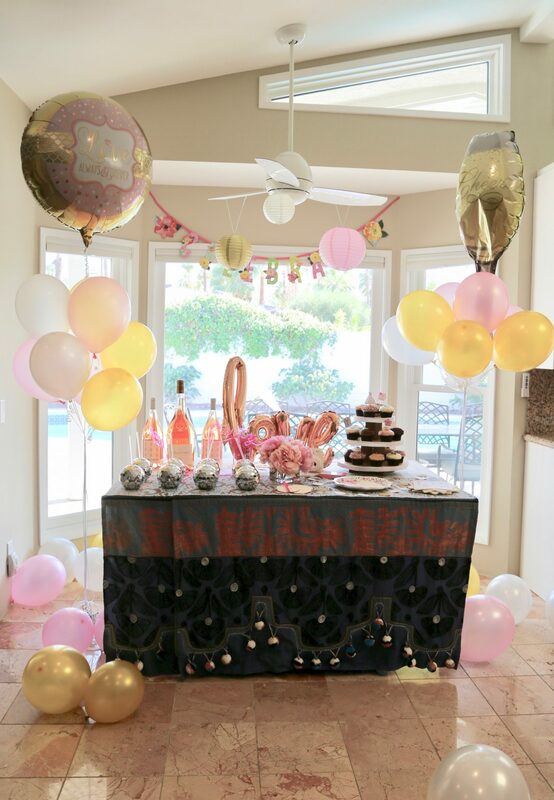 I love the “celebrate” banner because it really brightens up the whole room in a stylish way, without being too theme-y or cheesy! It’s the perfect way to celebrate! Happily Ever After Dinner Plates, buy here. Happily Ever After Lunch Napkins, buy here. 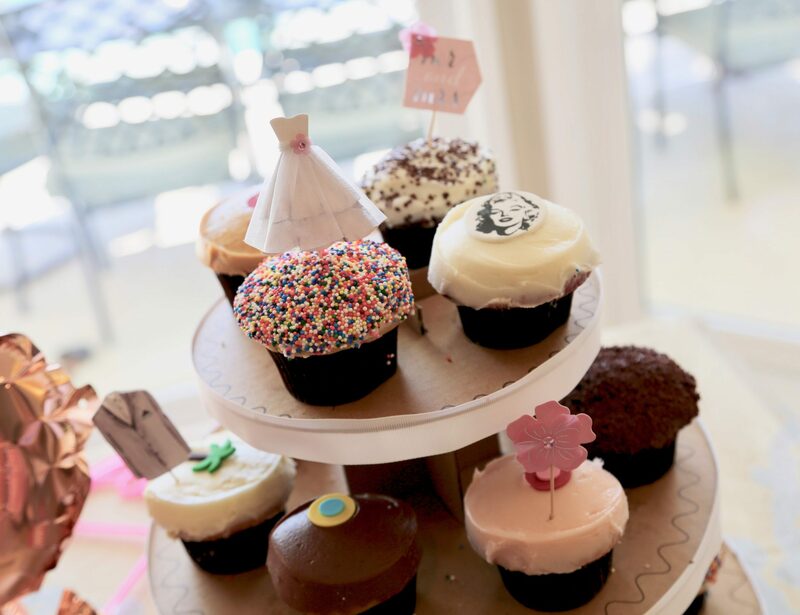 I love cupcakes and dessert, so of course I had to incorporate some sweets into the celebration! The Papyrus plates and napkins were the perfect complement! I added even more color and fun to the cupcakes with the party picks! I made goodie bags for all the girls, and had to include my favorite Papyrus card for the occasion! This card was especially perfect for the weekend because all of the girls celebrated with rosé! 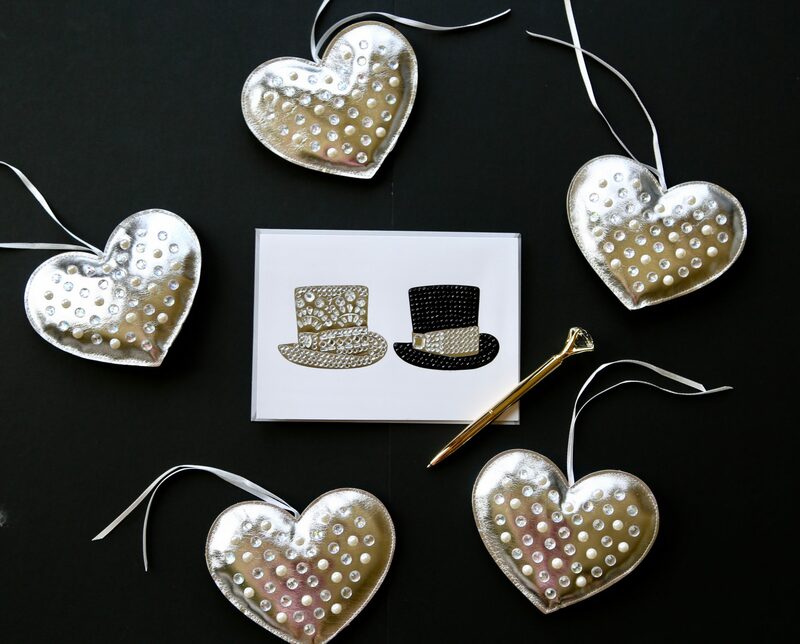 I also added the puffy silver heart gift topper to decorate and elevate every gift bag! Cheers Watercolor Champagne Card, buy here. Don’t you think the gift toppers add a great “something special” to each bag?? Shop more Bridal Party themed here! Weddings are one of the most special occasions of your or your loved one’s life, and I think that attention to detail really makes it more memorable. The Papyrus wedding collection is the perfect one-stop shop to get everything you need to make the occasion perfect. And if you need more inspiration for the big day, you can get it here and all things wedding here! Shop more of my favorites from the wedding collection below! Celebrate with Papyrus! Xoxo. Couture Love Wedding Lace Card, buy here. The Couture line has the most elevated and exquisitely designed cards in the whole wedding line! It takes the art of the card to a whole new level- I just love them! Beach Wedding Scene Card, buy here. Cake on Floral Wedding Card, buy here. Two Grooms Silhouette Card, buy here. Mrs. & Mrs. Bridal Veils Card, buy here. Wedding Vintage Lace Correspondence Cards, buy here. Handmade Wedding Dress Thank You Boxed Notes, buy here. Elegant Floral & Scroll Roll Wrap, buy here. Chevron Text Roll Wrap, buy here. 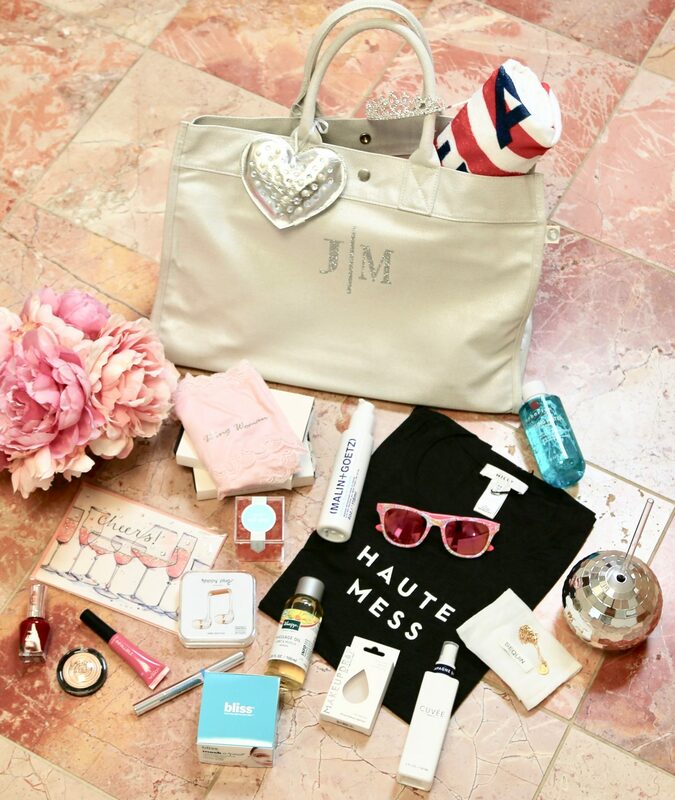 Forever Love Medium Gift Bag, buy here. Rainbow Reflections Tissue Paper, buy here. Silver Fiber Tissue Paper, buy here. Happily Ever After Banner, buy here. Happily Ever After Dessert Plates, buy here. Vintage Lace Beverage Napkins, buy here.